Ship Modeling from Scratch by Edwin B. Leaf is a good book to learn different construction techniques. It is 100% static models, so if you are looking for RC model boat construction, this isn't it. Boat Modelling by Vic Smeeds is my favorite Model Boat Book. Plank on frame at it's best. Ship model by August F. and Winnifred Crabtree - on permanent display at the Mariners' Museum. I'm retired and am looking to start a boat building hobby, so I have some questions. 1. Any suggestions on inexpensive "light tables" for transferring images from plans to template? 2. Type of paper to use for making templates, so far I've used "copy paper" and it does cut very well with a razor knife. 3. Book or magazine (on-line) suggestions for "learning model boat building". I understand that you build the frame upside down,(I'm not familiar with boat part terms). I surmise you cut the "center piece", then the individual "support pieces", "transom" and begin gluing the individual pieces together. QUESTION - how do you hold the pieces in place while they dry, do you do one piece at a time, how long to dry. Guess that's enough to get started. Hi Tom and welcome to the hobby! 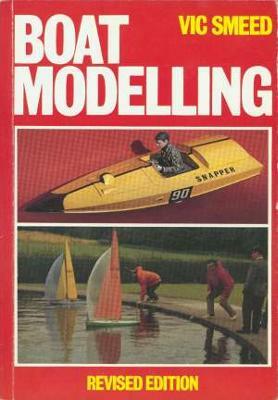 First, if you haven't seen the section on Building Model Boats, I recommend you browse through it. It's an attempt to be a "primer" (even if it feels a bit incomplete at the moment). It describes some construction methods - mainly the "bread & Butter" that you may have heard of. Right now this site lacks in examples of "strip planking", whether it be plank-on-frame or plank-on-bulkhead. And, YES, there is a difference. Most kits are plank-on-bulkhead, but apparently calling a horse by its real name doesn't sell. Most manufacturers and dealers incorrectly use the term plank-on-frame. Plank-on-Frame is something entirely different where every frame of the original is represented on the model. See picture above. The PT-109 model on the other hand, is a good example of a sheet planked Plank-on-Bulkhead hull. Most of us will never attempt a true Plank-on-Frame and that's fine by me. Template can mean more than one thing in this context, depending on which construction method you are pursuing. It sounds like you are building a plank-on-bulkhead model, so "template" I take to mean to trace onto the balsa for the bulkheads etc. Here I also assume the section view of the plan only shows half of each section. I believe generally the center section is typically marked on both halves. The sections moving towards the stern are typically to the left, and towards the stem is to the right. Although, I don't believe this is set in stone. Another method is to use carbon paper under your plan. Some even use this technique directly onto the wood. I would not recommend it though. The method I've always used, is to take the plan to a copy store and run a copy of the section view (which is to become the bulkheads), one of the stem and one of the stern profiles. I lay the plan out on the copier making sure I get as much info on the sheet as possible. I'm cheap, so if I can get them onto a letter-size paper I will. These sheets will become my masters. Next I lay in any reference lines that may be necessary. More about that later. The stem and stern copies are used for profile templates for keelson, transom and shear angles and the like. In most cases any missing information between the stem and stern profile can be recreated on taped-together graph-paper with a batten or straight-edge. Most keels are straight, so a straight stick of wood is used. Next I go back to the copy store and get the same amount of copies as I need bulkheads of the section plan, plus a couple of extras in case I mess up. Next I number the sheets of paper corresponding to each section number. If there are no numbers, I create them and mark them on the profile working drawing that I created. On each sheet I also use a yellow hi-lighter and mark the section that corresponds to the number on the sheet. When this is all done I fold the sheets carefully down the center-line. You can score very carefully with the X-acto knife and a straight-edge to get the fold exactly where you want it. With a pair of scissors I trim the templates according to each hi-lighted section. Once unfolded I have a perfect, symmetric set of section templates. Copy paper in my method as I described it or tracing paper. I believe tracing the sections to become templates will be less precise, but I have little experience with the tracing paper. I've always used the copier. Ship Modeling from Scratch, by Edwin B. Leaf will give you the basics, a handy glossary and he'll show two models he's building. 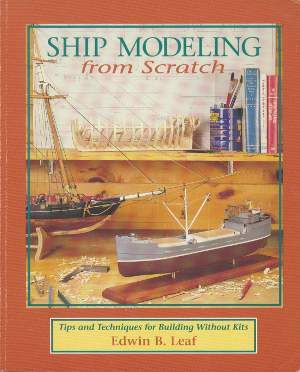 This book is all about static model ships, and mostly from wood and metal, so nothing on styrene sheet or casting resin. I think it's a good book to get the basic understanding of the entire process with fairly detailed tips on how to create certain details from scratch. Boat Modelling, by Vic Smeeds. 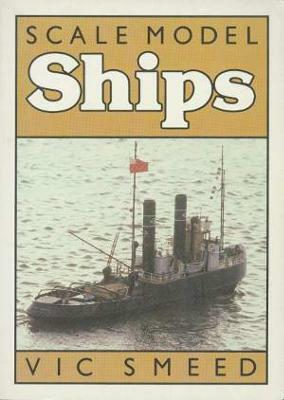 This is my favorite model boat book. It was first published in 1954. A revised, 16th edition came out in '85. It's soft cover and only 128 pages, but I love it. It's more geared toward working models. It is very casual and creative in its approach. It shows a lot of hull construction methods that go beyond RC boat models. Scale Model Ships, by Vic Smeeds. This is a good backup or alternative to the previous book, and they do cross over. It's as good as the other, but focuses more on working scale models rather than model boats in general. As for a magazine, I have not read any in years, but Model Boats Magazine out of the UK used to be decent. I'd use 1/8" for bulkheads and anything structural, and 3/32" or even 1/16" for planking. Typically you want a little denser material than the lightest stuff the plane builders like. If you pick it out yourself, try picking even sheets where the entire board has a somewhat consistent density. Also look for straight grain etc. Balsa is so easy to work that this will be a short list. I like to use "Dope" (Nitrocellulose Lacquer) to seal the balsa before painting. The most annoying aspect of balsa is the "fuzz" that raises when you sand it. A small plane that accepts razor blades is handy to taper strips for planking. Don't get one that takes special blades, you should be able to use off-the-shelf generic blades. A building board - generally it needs to be flat and without twist. Traditionally a material is used that you can push pins into the board. That's the old-school way of holding the bulkheads, keelson and transom in place while you plank it. The stuff bulletin boards are made from seems to work well. When you build you lay a piece of paper down with the stations marked. Stations is the term used to denote location of the bulkhead along the length of the hull. On top of this paper I generally lay Saran wrap. It helps protect the paper and building board from grue. Parchment paper is old-school, but it's so hard to see through. As to your final question. The hull is normally built upside-down and the bulkheads pinned to the building board. Extend the bulkheads to a predetermined, arbitrary reference line outside ("above") the hull proper (that you marked on your "master" section copy). If the bulkheads were cut with the grain in a vertical direction, it's a good idea to score the balsa where the bulkheads will be trimmed after planking. With this method you'll waste some material, but it should be minimal. Cut each bulkhead in half at an arbitrary "waterline". A Waterline as its proper term, is any plane parallel to the Design Waterline (which is exactly what you think of as the waterline). For this method or construction, the plane you pick is best chosen relatively close to the deck. The lower part of the hull is built on the board as outlined earlier. Once planked it is detached from the building board and the upper part of the bulkheads are glued on, and the rest of the hull is planked. That should be enough to get you started. Feel free to use the "comment" feature for follow-up questions. For new, unrelated questions - just start a new one. DFD1912, I think the material thicknesses you listed sounds OK given the size. Cabinet grade Baltic Birch Ply should be fine. I would go with 1/8" planking and apply a couple of coats of epoxy/fiberglass to the outside after planking. For planking material, depends what tools you have and/or material available locally. Obviously there are a lot more options if you can process your own wood. Linden or Basswood is an old classic. It doesn't have a lot of strength or stiffness, but is easy to work with. If covered in epoxy/fiberglass the wood underneath won't matter. I'm sure Poplar could be used as well. It is similar to Basswood - not very strong or stiff. Mahogany of course is the old classic, but is getting scarce and expensive. Normally I wouldn't recommend softwoods for planking because they don't bend well. However, a WW1 battle cruiser hull doesn't have a lot of curvature to it. If using solid blocks in strategic places I think Cedar, Pine or Spruce could be used. I am continuing my program to build this battlecruiser model. It will be almost 7 ft in length and about 12 inches in the beam. Quite heavy, I project. My previous post was not about how to cut the bulkheads and plank the hull. I need suggestions on what thickness of plywood should be used on the keel that will run most of the length(maybe 5 or 6 feet long at the bottom) and what thickness of planking should be used for the plank-on-bulkhead construction. I was planning on maybe a 3/4-inch thick keel about 4 inches tall and bulkheads of 3/8 inches thick. Planking would be 1/8 inches thick, or maybe 3/32 inches. Does that sound right? I built the Normandie back in the 1980's mainly with balsa, and it turned out nicely. Bulkheads and planking were thinner. But this monster that I want to build will need to be stiffer. BTW, I am ordering a 1:100 kit for SMS Lutzow from Herr Manfred Zinnecker in Germany. He cannot provide the fiberglass hull as his mold became defective. But he will provide all the rest of the kit to complete the model. I'm scratch-building the hull. - Keel / central longitudinal frame? This will be a static museum-quality display model. I hope I'm not too late. I have no idea how old this thread it, but I wanted to make a few suggestions. First: there is no easy way to make a model ship. I would recommend one or two kits to get some background. You can make many excellent and satisfying models from kits. Then, if you wish, take the leap to scratch building. To do so you will need to purchase the tools to do the job. Second: Research, research, research. Get plans. And study them until you are certain what each little line means and why it is there. Make drawings. Make more drawings. Ship plans generally have three views- top, side and what would normally be called a front view, although with a curved object like a ship this view is divided into two halves, one looking at the front of the vessel and the other looking from the rear. The side view will generally have vertical and horizontal lines. The vertical lines are contour lines, and are parallel to the keel. If you are making a bread-and-butter or plank-on-bulkhead type these may be all you need, but if you want a real plank-on frame style you will need to use these as a guide for drawing the actual frames. 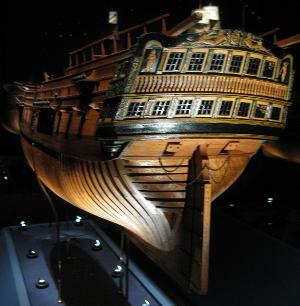 The positioning and construction of the frames in a real ship varied widely throughout history, so in order to do an accurate job you will need to research. One tricky part: on the side view you will also see horizontal lines. You may assume they are parallel with the keel and hence at right angles to the vertical contour lines. They are not. They are parallel to the water when the ship is floating. You will need to make your own set of horizontal lines to make up for the discrepancy. Third: Do not use balsa wood for anything on a model ship. It is fine for flying model airplanes, but it really has no place on a ship model. You will need to use hardwoods that hold and edge and can be handled even when quite thin. I am currently using, for my frames, walnut sapwood that I acquired for free- milled down to very close tolerances and properly dried. When people hear 'model" they think "balsa", but this is misguided when it comes to making a good ship model. Fourth: as one example of many regarding how a ship is put together: most sources will tell you how easy it is to make the planks by steam bending and so on. But a ship is 3-dimensional, and the strips are flat, and real shipbuilders know that. So they do not bend the planks. They carve them. Each plank is carved and tested and carved again and shaped to fit just right. And so it is with any part of a ship, real or model. It will take time, but in the end it will be much more satisfying. Finally: Research, research, research. Have I said this before? There are lots of books and on-line sources out there, and many of them oversimplify the process. Each part of a ship is intricate, and in my experience, in order for all the parts to fit you need to make even the most complicated part exactly like they did in the real ship, or as close a possible. I have two models in "progress." One is my own design and the second is the Carvelle Minor, which I bought plans for. Carvelle Minor runabout made of balsa. Attached are pictures of the "Caravelle Minor" model. I've completed the first sanding and the windshield and instruments (instruments are my own addition) are made but not installed. Fellow "beginners", I've never done a model boat from a kit. I've built many plastic cars, in my youth, from kits, so this has been a learn as I went process. 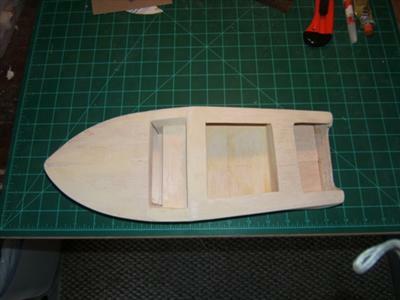 I cut from "balsa" the keel, transom and bulkheads and then assembled the frame of the model. For fellow beginners, thought I'd share my progress as I progress with my first Scratch Built Model Boat. For several weeks now, I've been drawing "keel" and "bulkhead" designs. Today I transferred a design onto copy paper, then copied to 1/8" cardboard and produced my first "keel" and "transom" temple on cardboard. Tomorrow I'll copy and cut out the "bulk heads" and attach then to the "keel." FYI, I don't have a "tracing light board", so I improvised and used a window. Other than having to work in a horizontal plan, it will do until I can get what I want. Let me also say, others have encouraged doing a simple project first, get it done and feel the "excitement" from a finished project. I know concur!!! I'm anxious to get some balsa and start building my first boat. I'm going to use 1/8" x 4 x 36 for the keel and bulkheads and 3/16" 4 x 36 for the planking. My hopes are lighter material for my first balsa wood experience will be easier to work with. Hope to hear from other "beginners." so we can share ideas and progress in our projects. I'm a newbie to model boat building and since I've spent my life around boats, I find that I'm lacking in understanding of some terms. So, here is a link to "boating" terms. Hope this helps you as much as it did me. You're welcome. There is always room for one more! Thank you for your detailed instructions. I too, hope this helps others. Let me digest this and I'll be back with some qualifying questions. I currently have two projects (on paper) going. I purchased a model boat plan "Carvelle Minor" and a frame of my own design. I'm about ready to transfer the image to balsa wood and start my first model.